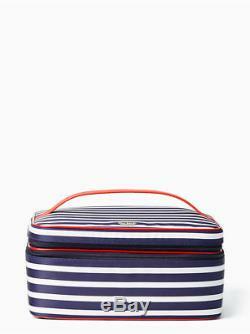 KATE SPADE CLASSIC MICAH SAPPHIRE & CREAM STRIPE TRAIN CASE COSMETIC CASE SET WITH RED LEATHER TRIM. 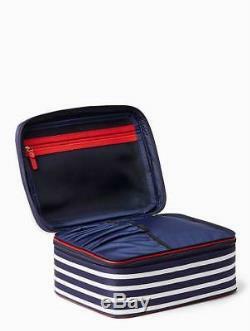 Brand new Kate Spade Classic Micah Sapphire & Cream Stripe Train Case Cosmetic Case Set with Red Leather Trim with tags. This Cosmetic Case Set has 2 Cosmetic Cases in 2 sizes. There is a Large Train Case Cosmetic Case and a Travel Cosmetic Case. Each Case is constructed of a strong and durable Nylon with a Jersey Backing. Each Case has Sapphire Blue and Cream Stripes with Red Leather Trim. The Red Leather Trim is on the edges and the seams. Each Case has the custom Signature Navy Blue wipeable fabric lining. Each Case has the signature polished 14K Yellow Gold-Dipped Hardware. Each Case has a Kate Spade signature and logo on the exterior. The Large Micah Cosmetic Case is a Train Case Cosmetic Case. It measures 10.5 inches wide x 5 inches high x 7.5 inches deep. The Train Case has a large base with two large sections. The Train Case has dual zippers that open from the center to the back wall hinge. The zippers sit at the top collar of the Train Case just below the lid. A matching full width top handle has a raised area to accommodate the fingers. The interior of the lid has a zipper pocket with red leather trim. 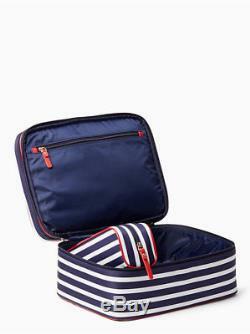 The Train Case is lined with a Navy Blue Nylon wipeable lining. An open slip pocket is on the back wall of the base. The Travel Case is stored in a base sections of the larger Train Case. Kate Spade defines the second case of this Set as a Travel Cosmetic Case. It has the same design as the Large Train Case. It measures 10.5 inches wide x 3.5 inches high x 3.75 inches deep. It has a Top Zipper Entry and a Red Leather Zipper pull. The zipper opens from the middle of the left side to the middle of the right side. This zipper opening design allows for a complete view and complete access to the interior of this Cosmetic Case. It has the Navy Blue durable Nylon wipeable lining. An open slip pocket is on the interior back wall. This Travel Case will be packaged in the base of the Large Train Case. This Kate Spade Classic Micah Cosmetic Case is a colorful design. Both Cases have Sapphire Blue & Cream Stripes with Red Leather Trim. Each Case is spacious with plenty of room to meet your needs. The Train Case and the Travel Case would be perfect to use for both home and travel. This Cosmetic Case Set may be divided giving you the option to have one or two great gifts. Keep one and give the other as a gift. Whatever your choice, the Classic Micah Cosmetic Case Set is a wonderful Set. The item "KATE SPADE CLASSIC MICAH SAPPHIRE & CREAM STRIPE TRAIN CASE COSMETIC CASE SET" is in sale since Wednesday, September 19, 2018. This item is in the category "Health & Beauty\Makeup\Makeup Bags & Cases". The seller is "morethan300yards" and is located in Gibsonia, Pennsylvania. This item can be shipped worldwide.